In the US, the race for presidency is a long process that includes primaries, caucuses and national conventions, in which the parties’ candidates are determined. The main popular vote on who is going to be president of the US is called general election and will take place on the 8th November this year. In the general election US citizens vote for one president and one vice president. However, these votes only elect people known as electors, who will then vote for the president and vice president in the name of the people whom they represent. Each state has a predefined number of such electors, and the candidate with the majority of a state’s electoral votes gets the support of all electors of this state. That is why states with a large number of electors, such as California, Texas or Florida, have the biggest impact on the presidential election. To be elected president, a candidate has to get more than half of all electoral votes, which is at least 270 votes. Many states are traditionally Democratic or Republican, except for the so called “swing states”, where the divide between red and blue is narrow and a few votes can be pivotal for the outcome of the election. 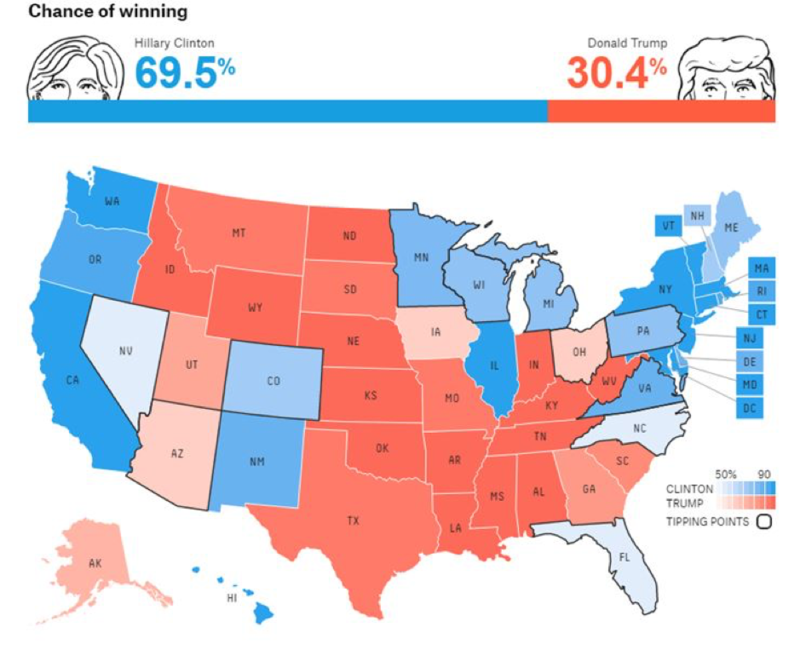 These are the states whose polls and first counts can help to forecast the election result before states on the west coast even close their polls. This year’s presidential election differs from those in the past in many aspects. Hillary Clinton, former First Lady and Secretary of State is running candidate for the Democrats and could be the first woman in the oval office. Donald Trump, real estate mogul and talk show master is the Republican’s candidate and could be the first politically unexperienced man in the oval office. Both are among the least popular candidates ever in a US presidential election, which is due to an ideological spread in the population that cannot be covered properly by two people alone. Clinton is the candidate perceived as yielding stability and continuity in the US. She is experienced in US politics and has been praised for her diplomatic and pragmatic approach to negotiations. Her goals are similar to the Democrats’ general stance and coherent with Barack Obama’s decisions in many aspects. She aims for modest tax cuts in the middle class and higher taxation for incomes above $5m a year. Infrastructure, renewable energies, child care and education are sectors which will profit increased government spending during her presidency. Besides, she plans to cut oil production, restrict drug prices and implement stricter gun laws, which will have major effects on these industries. Contradicting earlier statements, she has recently taken an opposing stance towards international trade agreements and might strive to renegotiate among others the Trans-Pacific Partnership Agreement. Trump is the candidate causing worries about future US politics in the international community. He is known for his undiplomatic behaviour, sexist and racial statements and a lack of political experience. His presidential goals involve cutting taxes across all income levels and corporations, while simultaneously stepping up infrastructure and military spending and reducing the current account deficit. It is most likely that he will implement the first two but increase the deficit. Besides Trump’s strongest calls are about renegotiating or breaking up trade deals, implementing protectionist tariffs and deporting millions of illegal immigrants, in addition to building a wall on the southern border of the US. These goals cause most uncertainty in the international community and are most appealing to his core voters at the same time. Many of Trump’s statements are contrary to traditional conservative perceptions but nevertheless he is closing the gap between himself and Clinton in the polls. Firstly, one has to acknowledge that sentiments towards global trade, movement across borders and international cooperation have changed and people are more anti-trade, anti-immigration and anti-cooperation than ever before. A growing segment of the US people desires a radical shift in politics, to focus on increasing national prosperity rather than international commitments and this is exactly what Trump promises. Secondly, many people claim to vote for Trump only because his adversary is Hillary Clinton. Part of the population has lost trust in the non-transparent political-financial complex in the US and wants to see change. Clinton personifies the old system and, therefore, she finds opposition. Furthermore, she has done a bad job in sustaining her integrity and credibility with an email affair, currently being investigated by the FBI. Many people do not trust her anymore and prefer the controversial but honest stance of Trump. 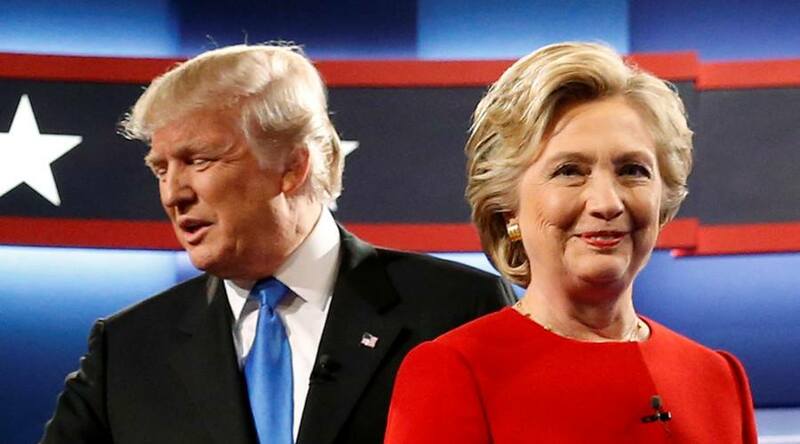 Given Clinton or Trump becomes president, neither of their election programmes is certain to be implemented yet. In the US, legislation has to pass through the houses of Congress (the Senate and the House of Representatives), before it can be officially declared. At the moment both houses have a Republican majority. However, alongside the presidential election on Tuesday, 34 states will vote on Senate members and 435 seats in the House of Representatives will be reshuffled. If either party would make a complete sweep, taking the presidency and both houses of Congress, this would mean the president will be able to make far reaching reforms without major political headwinds. However, the polls currently indicate the Senate turning towards a Democratic majority, while the House of Representatives is expected to remain in Republican hand. Thus neither Party will accomplish a sweep and the elected president has to rely on the other party’s consent to pass legislation. This will lead to fewer big reforms and generally smaller influences in the markets. Comparing historical evidence, we can ascertain that presidential elections in general do not cause major fluctuations in the markets. Before the election, volatility indexes historically rise on average, but this effect is normalised within 90 days after the election. One of the major influences that this presidential election can have on the US economy is indirect. Depending on which scenario of President and Houses of Congress there will be, the FED might finally raise interest rates in December or not. This in turn will affect markets fundamentally. As the graph clearly shows, analysts currently expect rates to increase in December with a very high probability. Therefore, the market is already pricing this major change, but these expectations can change following the election results -especially if Trump will prevail- and this can have a great impact. Another point to keep in mind are the chances of the two candidates of being elected, which differ substantially. Since the beginning of October, the effective campaign of Hillary Clinton and the poor performances of Donald Trump during the debates (especially the first one) increased the preferences for the Democratic candidate. Around October 20th, the probability of Clinton being elected reached 87%. Even after the disclosure of a new investigation conducted by the FBI related to the well-known email affair, her chances are still over 65%. This means that the major impact in terms of market reaction will happen in the case of Trump elected president. Still, the market is unlikely to underestimate the possibilities of Trump after what happened with Brexit. The outcome of the presidential election will not have an immediate effect on European and American trade floors, since first results are likely to be known around 4 am (GMT) on November 9th, that is outside the trading hours of the LSE, Frankfurt, NYSE, NASDAQ, Toronto and Mexico. The first ones to react to the presidential election on the markets will be Tokyo, followed by Shanghai and Hong-Kong. In order to understand the impact of the election on the US stock market, it is useful to look at the correlation between the polls and the S&P index. The index seems to show a very strong positive correlation with Clinton’s chances of becoming president, and a somehow negative correlation with those of Trump. This goes against historical evidence: the reason is that the market prefers the stability and certainty that Clinton guarantees, over the corporate tax cuts promised by the Republican. Still, if we look more in details into the different sectors and industries, we can find some examples of positive correlations with Trump. These are in particular the Financial and Health Care companies, which show a correlation respectively of 0.41 and 0.25. The reasons for this behaviour are two-fold: first, the already-mentioned tax cut that Trump sustains; second, and more important, the general deregulation that he is planning in the financial and pharma market. Also the Industrials seem to show a low but positive correlation with Trump chances (0.12), probably again because of the proposal of cutting taxes and more generally of “making America great again and bringing back stolen jobs”, which can translate into benefits and stimuli for these sectors. Do not forget, however, that these historical correlations have to be taken carefully as it is all but sure that they will continue in the future. As a conclusion, these are the strategies that we recommend to follow in the two scenarios. If Trump wins, short the S&P index and buy the sectors that should outperform the market: to the ones previously mentioned defence should also be added, since Trump is prospecting high increases in the public spending in this sector. On the Hillary side, conversely, the investor should buy the index (do not expect more than a sort of relief however, given that she is already expected to win) and in particular bet on some sectors that may benefit the most from a Democrat’s presidency. These are the discount retailers, that could have positive prospects from a rise in the lowest salaries; hospital facilities and green energy, thanks to the increased public spending and endorsement in these sectors; and homebuilders, as Hillary is planning affordable houses stimulus. Remember, however, that on both sides the impact of the election will be much smaller in case of a divided Congress. 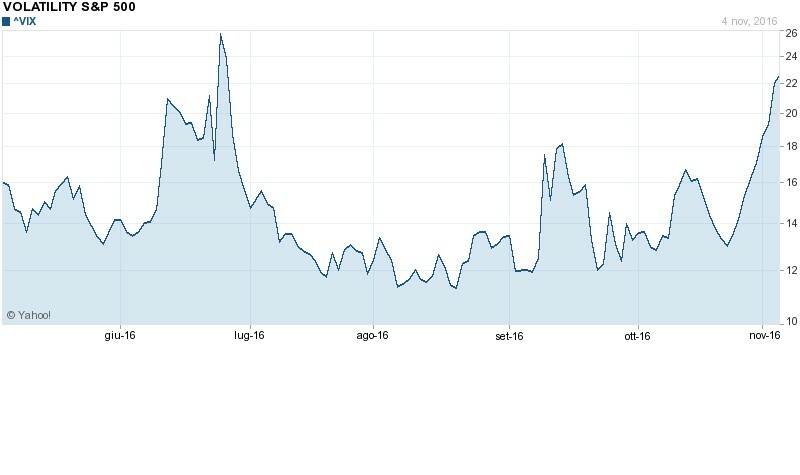 Linked to the equity market is the volatility index (VIX). Without getting too technical, this index captures the implied volatility and is constructed on the basis of the prices of options on the S&P. The idea behind is that if the difference between the price of a call option and that of a put widens, the conclusion is that volatility is expected to increase in the future. The index is currently trading over its historical mean (19.71), and median (17.84) – which is a more reliable measure given the non-Gaussian distribution of the index. The recent explosion of the index is due to the increased chances of Trump, but if he eventually wins it is expected to reach higher levels, as it does normally after shocks. Therefore, it can be used as a hedge on Trump. If Trump wins yields would be driven down as a FED rate hike gets less likely. There is also another factor to consider: a Trump win would cause markets to panic and to race for haven assets, such as US treasuries and other low-risk bonds, for instance Gilts or Bunds. We can provide two example to give an idea of what might happen: in the period after Brexit, 10y US yields fell 39 basis points while UK 10y yields over 80 bps; last Friday, after renewed statements from FBI on the investigation for Clinton’s email affair that led to a tightening in polls, both the 2y and 10y yields were pushed down. After this initial fall, many of the policies Trump has said he wants to pursue could actually drive yields up in the long term, such as the tax cuts and the higher spending on infrastructure, especially if Trumps maintains the control of the Congress. On the other hand, bonds that could benefit are energy industry ones because of Trump’s support for fossil fuels. Generally speaking, however, corporate bonds as well as riskier sovereign bonds will suffer should Trump win, and we would see widening credit spreads in the longer term. If Clinton wins, on the other hand, the risk-on mode should prompt a US Treasuries sell-off, which would probably spread to other debt markets as US treasuries are the global debt benchmark and as a FED rate hike would become more likely. The municipal bond market deserves a mention: given these bonds are tax-free, and the Clinton’s proposal of rising taxes on rich and on investments, they could represent an interesting investment. The USD is clearly the currency under observation in this election. As mentioned above, markets link the choice of the president to the likelihood of FOMC hiking rates in December. Since the end of the financial crisis, the US economy has showed a steady recovery (US Q3 GDP growth was 2.9%) driven by consumption and buoyed by the FED’s QE, a tightening labour market with the unemployment rate as low as 4.9%, level considered the natural unemployment rate for the US economy, and mounting inflation pressure. In this context, the allegedly data-driven FED keeps saying that the case for a rate hike is strengthening and markets are pricing in a high likelihood of a rate hike in December, with probability implied in Fed Fund Futures as high as 80% and the DXY index at 97.17, level not seen since March. If Trump wins, however, the following financial instability and economic uncertainty could prevent the FED from hiking as early as December. Trump has also criticised the FED for being too “political” and thus issues to FED independency would be raised. We think that a trade on the USD would be asymmetric: if Clinton wins the positive impact should be moderate as a rate hike is already heavily priced in; if Trump wins the negative effect could be much more severe. If you want to trade the USD, we also suggest to consider the JPY. Because of its well-known haven status, it should weaken in the risk-on environment that would follow a Clinton win. In this light, in case of a Clinton win, with USD strengthening and JPY weakening, the impact on USD/JPY should be significant. If you want to long dollar then, you could long the USD against JPY and short USD against another currency. This way you gain if the dollar appreciates more to the JPY than to the other currency and you also limit the downside should the dollar fall. On the other hand, Yen is currently considered one of the main winners if Trump wins. If you think that Trumps will win, you should short the USD against the JPY rather than just shorting the DXY. In the long term, however, any upside to the Yen is threatened by the BoJ action, which in its recent meeting hinted at a prolonged period of stimulus until at least fiscal 2018 when it expects to meet its 2% inflation target. The results of this election will create interesting trading opportunities in the emerging markets, in particular in Argentina, Brazil and in Southeast Asia. The emerging markets in general will be driven by any shift in the expectations on future interest rates hikes of the Federal Reserve. Since we assume that a Clinton’s victory would make a tighter monetary policy more likely to take place, we expect these markets to suffer in this scenario. On the other hand we must take into account that the markets have consistently priced a Clinton’s victory in the past few weeks and, in addition to that, all these countries are in a better shape than in 2013 and 2014 when it comes to absorb such external shocks: the foreign currency reserves are stronger, market-friendly governments are in power (in particular that is the case of Argentina) and foreign-currency debt as a percentage of GDP has consistently decreased (even though, on this last point, serious weaknesses are still present in the Asian markets). Besides that, the emerging economies are heavily sensitive to changes in the outlook on global trade. For this reason, a Trump’s victory and a solid risk of trade wars would create a strong risk aversion towards these markets with Argentina, that is a net importer from the US, as the only one that might not perceive the blow. As soon as the first results from the key states will come out, one of the protagonists in the markets will be the Chinese yuan. Given its sensitivity to the global trade outlook, we can expect the yuan to fall by several notches in case the first East Coast and Midwestern results will unveil a stronger than expected Trump’s performance. Another emerging market to follow during the night will be Russia. 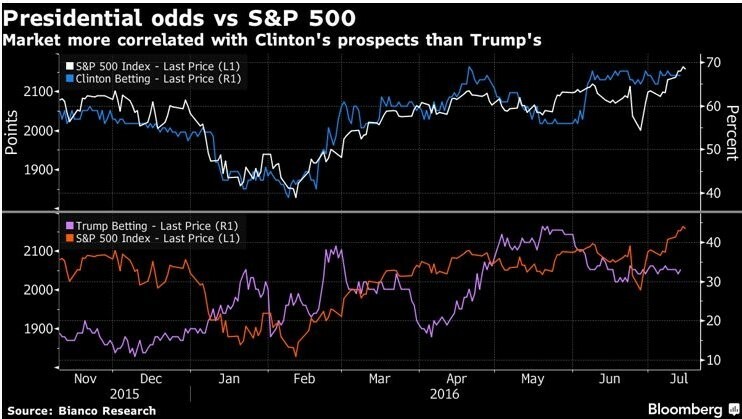 Indeed, it is no secret that investors are using Russian assets as a hedge against the polls putting Clinton ahead being wrong, thus linking its performance to Trump’s. Moving to commodities, gold will be the big winner of Tuesday night. Given the political uncertainty that will follow a weak electoral mandate to Clinton or a Trump’s success and given the inflationary policies pledged by both candidates, the target price of gold over the next weeks is steadily set around $1350 – $1450. 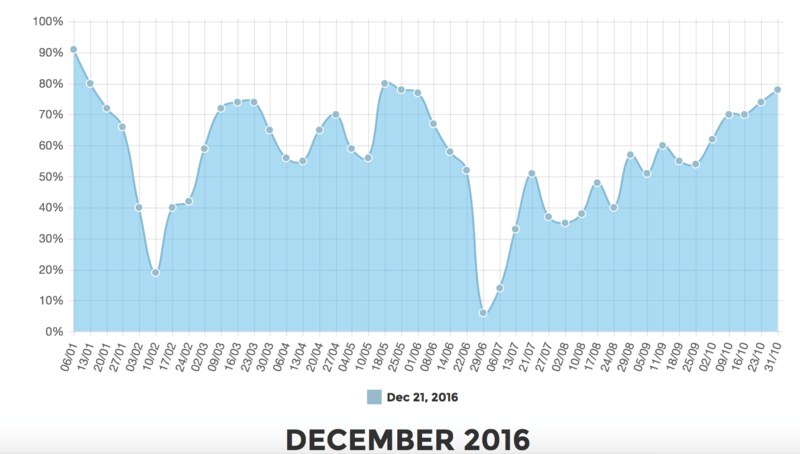 Crude oil has recently been mainly driven by the events related to the OPEC deal. Anyway, the outcome of this election will have an impact on the expectations on both the demand and the supply side of crude oil. In fact, the much greener agenda of Clinton is likely to keep the descending US demand of oil on the path that it has followed since the financial crises while, on the other hand, under Trump’s administration we can expect a halt to the Obama’s Environment Agenda, thus enhancing the demand of oil. For what concerns the supply side both the candidates are basically in favour of fracking, so we cannot expect major shifts for the projections of oil production in the US. Besides that, given the anti-Iranian positions of Trump and his opposition to the nuclear deal signed by the Obama administration, the election of the mogul is likely to bring back sanctions against Iran, cutting out more than one extra million of barrels per day that the country has been exporting since the sanctions were lifted and thus driving the oil price to a new rise. During the campaign, in an attempt to woo the working class in some key states (namely West Virginia, Kentucky, Ohio, Pennsylvania), Trump has regularly stressed the importance of supporting the US coal industry and of going back to this fuel as a primary source of energy for the country. Coal is currently mainly driven by Chinese production cap and growing demand and has seen a steep price rise (from $50 in June to $106 presently). However, if Trump was elected President we could expect to see further upwards pressure on coal price. In case Clinton wins we recommend also to follow the trends in the natural gas market. Secretary Clinton has repeatedly stressed the importance of this source of energy as a pivot for a transition from traditional fossil fuels to alternative sources of energy, thus we are likely to see a surge in the price of this commodity if the pledges are respected.